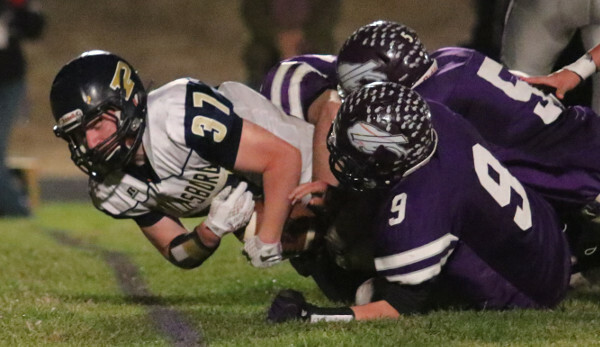 We have reached the state semifinals in the 11-Man classes of Kansas high school football, and the 8-Man state championship games will be played this Saturday in Newton. Kpreps will continue to post state rankings throughout the playoffs culminating in our final poll after the state champions are crowned. Let’s take a look at the Kpreps.com rankings for November 16th. Check out our complete Rankings for further details. The Class 6A poll has taken on numerous changes as the top three teams in last week’s poll were eliminated on Friday night. Derby is the new No. 1 team after the Panthers took out Junction City 46-27. The Blue Valley Tigers jump back in the poll at No. 2 after dominating last week’s No. 1 Lawrence in a 42-17 win. The Tigers will host No. 3 Olathe North this week in the semifinals. The Eagles used big plays to knock out defending champion Shawnee Mission East 44-30. The No. 5 Lancers outgained Olathe North by 175 total yards and ran 64 more plays than the Eagles in the loss. Lawrence Free State is ranked fourth this week after the Firebirds knocked out Wichita Northwest, 52-34. The Class 5A poll features one small change this week as St. Thomas Aquinas moves up to No.2 ahead of No. 3 Bishop Carroll by a couple of votes. The Saints eliminated St. James Academy 42-7 on Friday, and will take on top-ranked Mill Valley in this week’s semifinal. Mill Valley defeated Aquinas 38-20 in Week 1 of the season. Mill Valley eliminated No. 5 Pittsburg 56-21 behind seven total touchdowns by Christian Jegen. Bishop Carroll beat Wichita Heights 44-14 despite losing second-string quarterback Cannon Lynch. Third-string quarterback Braden Howell led the Golden Eagles to victory by rushing for 151 yards and two scores. St. James and Pittsburg round out the top five this week. In Class 4A-I, Bishop Miege blasted Paola 65-14 to advance to the state semifinals. The top-ranked Stags will travel to No. 5 Eudora this week. Eudora advanced to the semifinals by surviving with a 60-59 double overtime win over Basehor-Linwood. Second-ranked Topeka Hayden kicked a field goal with five second remaining to beat No. 3 Buhler, 17-14. Andover Central is ranked fourth this week after holding off a comeback from Abilene, 35-34. There are no changes in this week’s Class 4A-II poll. Columbus remains atop the poll after a 36-27 challenge from Santa Fe Trail. Second-ranked Andale got another scare this week, but escaped Hugoton with a 28-27 overtime win. Holcomb, ranked third, had little trouble in a 55-14 win over Wamego, while No. 4 Holton eliminated No. 5 Frontenac 22-7. In Class 3A, top-ranked Rossville won by its closest margin this season in beating new No. 5 St. Mary’s Colgan, 42-32. The Bulldawgs have now won 26th consecutive games and will host No. 4 Wellsville in the semifinals this week. Wellsville beat Sabetha 31-14 on Friday. Wichita Collegiate remains ranked second this week after a 66-25 win over Norton on Saturday. The Spartans will travel to No. 3 Halstead in the west semifinal. Halstead took advantage of several Hoisington turnovers in beating the Cardinals 44-8. Phillipsburg is the new No. 1 team in Class 2-1A as the Panthers knocked out previous No. 1 Meade, 26-21. The Panthers will take on No. 2 Smith Center in this week’s semifinal. Phillipsburg defeated Smith Center 14-7 on the final week of the regular season. Meade remains ranked third this week despite their loss, while Troy and Olpe round out the top five. The Trojans will host the defending-champion Eagles in this week’s east semifinal. The state championship games are set in both eight-man classes and will take place this Saturday at Fischer Field in Newton. The Division I game features top-ranked Spearville against No. 2 Hanover. Spearville won at No. 5 Solomon 68-36, while Hanover beat No. 3 Burlingame 56-32. In 8-Man II, the state championship match-up is a rematch from last season. Defending champion Victoria advanced back to the title game with a 40-8 win over No. 3 Sharon Springs-Wallace County. Argonia-Attica moves up to No. 2 this week after blasting No. 4 Axtell, 52-0. Victoria beat Argonia-Attica 52-8 to capture the 2014 state championship. Derby, Junction City, Blue Valley, Lawrence, Olathe North, Shawnee Mission East, Lawrence Free State, Wichita Northwest, St. Thomas Aquinas, Bishop Carroll, Mill Valley, Pittsburg, St. James Academy, Wichita Heights, Bishop Miege, Paola, Eudora, Basehor-Linwood, Topeka Hayden, Buhler, Andover Central, Abilene, Columbus, Santa Fe Trail, Andale, Hugoton, Holcomb, Wamego, Holton, Frontenac, Rossville, St. Marys Colgan, Wellsville, Sabetha, Wichita Collegiate, Norton, Halstead, Hoisington, Phillipsburg, Meade, Smith Center, Troy, Olpe, Spearville, Hanover, Solomon, Burlingame, Victoria, Argonia-Attica, Axtell, Sharon Springs-Wallace Co.